I hardly got any pictures this weekend because it was a busy one! It all started with breakfast at my sister-in-law’s Saturday morning. Breakfast turned into a morning long hangout session, and we did not get home until noon. Gideon tuckered out and fell asleep in the car on the way home, so we took a family nap together for an hour and a half! Today we were not home for more than 2 hours between the hours of 9 AM and 8 PM. After church we came home, had a quick lunch, and tried our best to get Gideon down for a nap. He refused it, and after half an hour of trying, we gave up. This afternoon was my oldest niece’s 4th birthday, and you know how those things go. A two hour birthday party turned into a four hour hangout session, and we didn’t leave until around 6:15 this evening. We headed straight from there to a gathering with a bunch of friends and church family. We got home at around 8:30. Poor Gideon signed “sleep” the whole way home, and after a quick bath he was out like a light. He did so well today considering he didn’t get a single nap in. One of Gideon’s favorite things at the moment is being a little helper. He cannot hear the dishwasher door open without running to help unload it. Gideon loves having a purpose, and feeling productive. The cheering and clapping and celebration of his efforts don’t hurt either. He loves putting things away, and says “uh oh!” when things are not where they belong. He also loves to put his own clean laundry in the dresser, and “sweeps” the kitchen floor for me. After meals, his “chores” are to put his dish and fork in the sink, and then push the high chair back to its place. At bedtime he gets his toothbrush and toothpaste out from under the sink. My parents left this morning after spending a few weeks with us, and I couldn’t let such a fun time go without blogging. From the moment my parents disappeared behind the tree line I have not had a free moment to process their departure. Gideon has been spoiled with more attention than usual, and woke up from his nap ready for non-stop play and stimulation. I decided to let house chores take a back seat, and focus on him. Although we made sure everyone gave proper farewells, Gideon is still too young to process that his grandparents won’t be back for a long while, or that things are suddenly different. He asked for my mom and dad all day, and did not let me out of his sight. Poor little guy. I am OK with having to wean him back into our usual daily routine, and letting him adapt to independent play again. Not having my parents here after seeing them 24/7 for weeks was enough of a step in the weaning process for today. For both of us. In an attempt to delay the inevitable crying and mourning session, I’ll get straight to the point. Zoo Day! Abuela wore Gideon in the sling, and they both loved it. Great way to bond on their first day together. 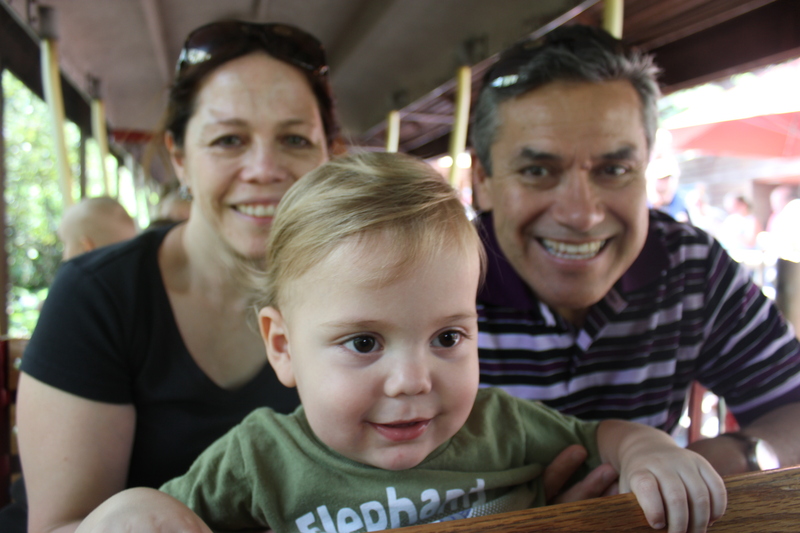 Gideon loved riding the Zoo Train with his abuelos! Gideon insisted on sitting in the seat like a big boy. We took Gideon to the Kentucky Horse Farm, and it was a hit with everyone. One night we made milanesas for dinner. Daniel and Gideon were in charge of prepping the potatoes for a side dish. The last time Gideon had all 4 grandparents together was when he was born. We took Gideon for his first train ride, and it was a hit! No amount of discretion can make Gideon miss the transfer of his pacifier from one place to another. Enjoying some snuggles on the train. We spent an afternoon at Washington Park! The weather during my parents’ visit was perfect. Gideon got more and more daring at the water pad, and got himself pretty wet! We spent a weekend in the country with my sister-in-law’s parents, and Gideon rode a tractor with his abuelo! Gideon absolutely loved it. Here is waving goodbye to us. 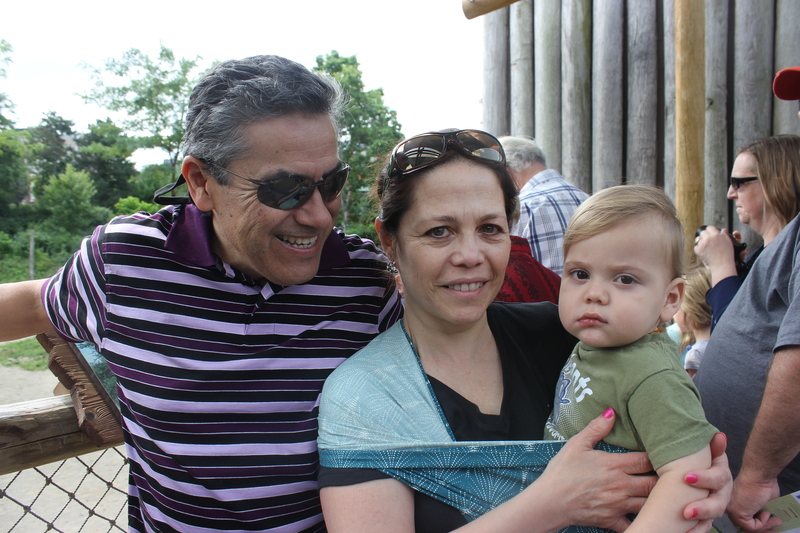 Gideon was hooked on his abuelos. He got to spend a lot of quality time with both of them, particularly my dad. Here is Gideon with my parents, and the quilt my mom made for him hanging in the background. There are hundreds of pictures taken while my parents were here, but these are a select few that I really love. 4. Gideon imitating my dad, walking with his hands clasped behind his back. 5. Gideon exploding with new vocabulary (predominantly spanish) with – not 1 as usual, but 3 spanish speakers in the house! 6. “Gideon call abuelo. Abueeeelo!”, Gideon would say “eeeeh … oh!” in a really soft voice. Adorbs. Opportunities to see my parents will take on a whole new magnitude of importance to me now that Gideon is in the picture. The older he gets, the more he will learn to treasure and really appreciate the people who love him most. Gideon asks about them all the time now that they are gone. I’ve decided I’m going to be honest with him, and keep my answers simple. I plan on telling him that they are at home, that they love him, and that they love God most. There is no doubt that having grandparents who love God most will inspire him to love God most, too.